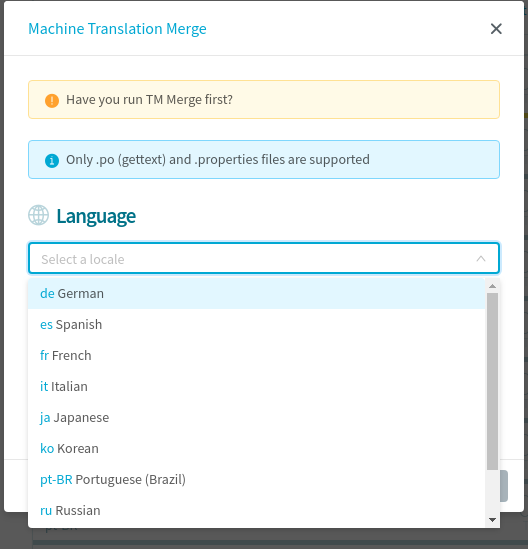 MT Merge allows users with MT-bulk role to prefill translations from configured Machine Translations service. This feature is only available to user with MT-bulk role. Only Gettext and Properties project type are supported. The operation is limited to one language at a time. Only fuzzy and untranslated strings will be changed. User can select to save the translations as fuzzy or translated. 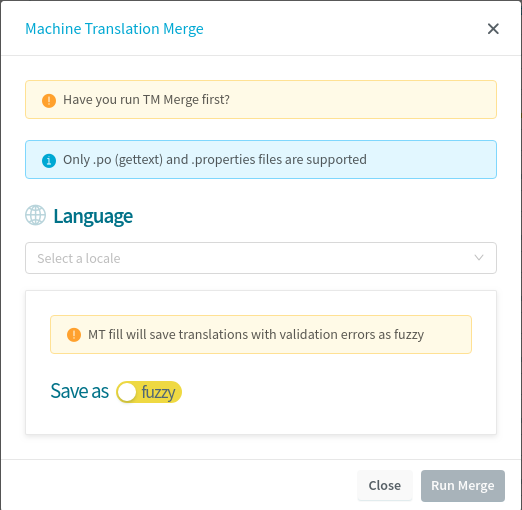 MT Merge will save translations with validation errors as fuzzy. Expand More Action menu on top right corner and click on Merge Machine Translations. This action is only available if for user with MT-bulk role. In displayed dialog, select the language you want to copy. Click Run Merge button to start the process. User can click on Cancel Operation during the process to cancel the operation. Note: This will only stop additional translations being copied. Any translations that have already been copied will remain.